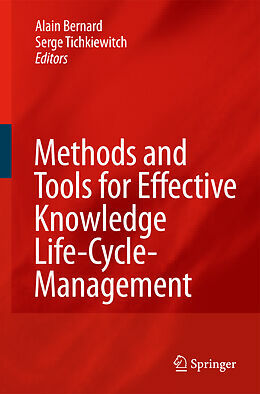 This unique book will help readers understand the complex topic of Knowledge Management. Moreover, the book underlines why knowledge is one of the most important strategic issues in achieving future manufacturing competitiveness. Knowledge Management is a wide, critical and strategic issue for all the com- nies, from the SMEs to the most complex organizations. The key of competiti- ness is knowledge, because of the necessity of reactivity, flexibility, agility and innovation capacities. Knowledge is difficult to measure itself but what is visible, this is the way of improving products, technologies and enterprise organizations. During the last four years, based on the experience of most of the best experts around the World, CIRP (The International Academy for Production Engineering) has decided to prepare and structure a Network of Excellence (NoE) proposal. The European Community accepted to found the VRL-KCiP (Virtual Research La- ratory - Knowledge Community in Production). As its name indicates it, the aim of this NoE was really to build a "Knowledge Community in Production ". This was possible and realistic because the partners were representative of the most important universities in Europe and also because of strong partnerships with laboratories far from Europe (Japan, Australia, South Africa, USA, etc...). Based on such powerful partnership, the main issue was to help European manufacturing industry to define and structure the strategic knowledge in order to face the strategic worldwide challenges. Manufacturing in Europe currently has two essential aspects: 1. It has to be knowledge intensive given the European demands for high-tech products and services (e.g. electronics, medicines). Prof. A. Bernard was graduated in 1982 at ENS Cachan. He contributed to LURPA laboratory since 1983 and obtained his PhD in 1989, on 3D feature-based manufacturing of forging dies. Then, as an assistant professor, he worked in Ecole Centrale Paris on product, technology and process modelling. He also created, in 1993, the rapid prototyping and reverse engineering platform of Ecole Centrale Paris, the CREATE. From September 1996 to October 2001, he has been Professor in CRAN laboratory in Nancy, where he managed a research group on mechanical and production engineering. Since 2001, he has been Professor in Ecole Centrale de Nantes. He was the Head of the "Industrial products and systems engineering" department for three years and he is now Deputy Director for Research of Ecole Centrale de Nantes. Concerning his recent research activities, he founded and was the Head of the "Virtual Engineering for industrial engineering" research team in IRCCyN laboratory for four years. Prof. A. Bernard has been the vice-president of AFPR (French Rapid Prototyping Association) and its representative in GARPA (Global Alliance of Rapid Prototyping Associations) for 15 years. Since July 2003, he has been one of the members of the delegation for scientific evaluation at the French Ministry of Research for four years. Prof. A. Bernard is member of national scientific committees and of professional and scientific international organizations. He is also member of the editorial board of six journals (Rapid Prototyping J, IJ PLM (Guest Editor Europe), IJ Product Development, IJ Numerical Engineering, Virtual and Physical Prototyping J, Academic J Manufacturing Engineering) and reviewer for others (CAD, Computers in Industry, CERA, Robotics and CIM, IJ CIM, J Engineering Manufacture, Engineering Applications of Artificial Intelligence, IEEE Transactions on Automation Science and Engineering, ASME Transactions Journal of Computing information Science in Engineering, IJ Design and Innovation Research, Mécanique et Industries, Document Numérique). Prof. Alain Bernard is an author who already published several books in Springer. Prof. Serge Tichkiewitch is currently the General Director of the "Virtual Research Lab for a Knowledge Community in Production" Network of Excellence. He was the first general director of the French PRIMECA network, the former director of the Integrated Design team of the Soils, Solids and Structures Laboratory, composed of 40 persons, and the director of the Industrial Engineering and Management School of Engineers in Grenoble's Polytechnic Institute of Technology. All the contributors are several of the main actors in Design and Manufacturing domain. Most of them are CIRP fellow members and have a strong experience in developing knowledge-based systems and services. This means that Knowledge Management has been implemented during industrial projects and the results/case studies are described and explained in different ways, key issues and strategic aspects, strong difficulties, main methodologies for success. The background of the co-authors is not only theoretical, it is also based on a strong application experience with collaborations that allowed developing new KM approaches in companies context. 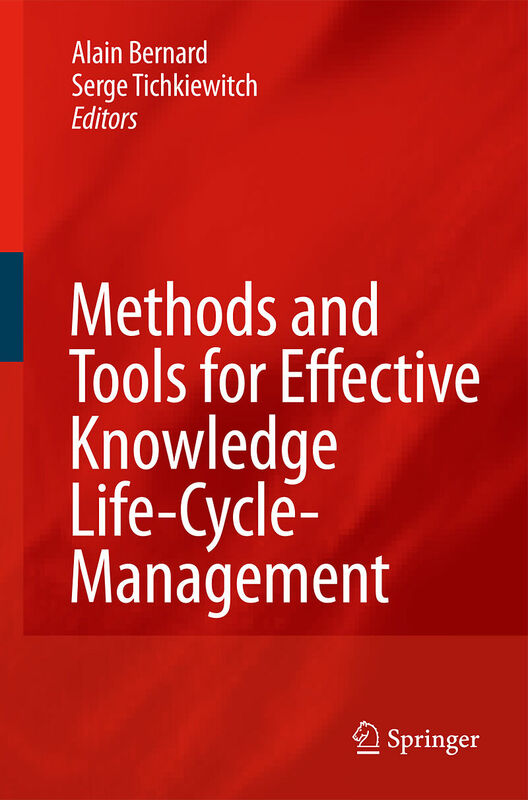 Introduction.- What is knowledge?.- Communities.- Knowledge extraction and formalization.- KM models and methods.- KM tools.- Case studies in design.- Case studies in process planning.- Case studies in manufacturing.- Case studies in industrial heritage.